← How Do We Join the Deaf Community? 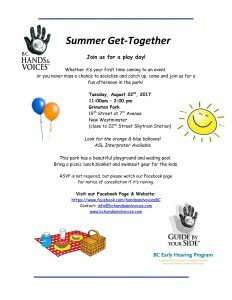 Join us for a play day! Whether it’s your first time coming to an event or you never miss a chance to socialize and catch up. Look for the orange & blue balloons! This park has a beautiful playground and wading pool. Bring a picnic lunch, swimwear, towels and blanket. This entry was posted in Babies, Events, Families to Families. Bookmark the permalink. Follow any comments here with the RSS feed for this post.